Clients of Websites1st range from start-ups to SMEs in Surrey, Hampshire, Berkshire, London, Buckinghamshire and beyond. Below are some client examples and the services we have provided to them. Click on the client name or website thumbnail to view the live client sites. Secure https:// hosted WordPress website with WooCommerce eCommerce and secure payment capability. 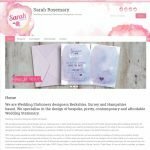 Sarah Rosemary are Wedding Stationery designers covering Berkshire, Surrey and Hampshire. They specialise in the design of bespoke, pretty, contemporary and affordable Wedding Stationery. They are passionate about great design and their initial passion to start Sarah Rosemary was formed in 2013. New https:// secure website with Booking Form linked to MailChimp, Social Media and Trip Advisor links, News blog, Google My Business map. 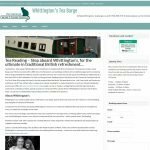 Whittington’s Tea Barge is the ultimate in traditional British refreshment. On board our modern canal barge, you’ll find a tea room with a difference. Contemporary surroundings combine with a traditional approach to preparing and serving great British breakfasts, lunches and afternoon tea. 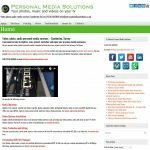 Personal Media Solutions of Camberley, provides video, photo and audio media services. A personal service to digitise, save, protect, declutter and enjoy your precious family memories. 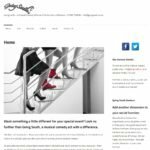 Websites1st created a new website for Personal Media Solutions, optimised for all major search engines, a Pay-Per-Click marketing campaign via Google AdWords. Other online marketing activities now mean that 80% of Personal Media Solutions business clients now comes from online sources. 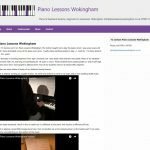 Teaching beginners from age 6 onwards, older learners and adults. Many students have been learning and developing for 10 years or more. Students have passed grade 6,7 and 8 with high marks and also to diploma level. Some students go on to study B.Mus degrees. New retail store home page with links to eBay shops. AC Models are an Eastleigh based shop selling a huge range of model trains, slot cars and die cast toys. The company is highly successful on eBay but did not have their own web presence for their growing customer base and to support their new high profile premises on Eastleigh High Street. Websites1st built a basic home page for the Eastleigh retail shop. A new responsive, mobile friendly basic 3 page website for startup Camberley based Floor Medics. 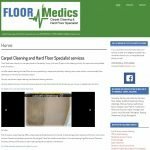 Floor Medics are a family run company based in Camberley, Surrey, with over 25 years in the cleaning Industry. 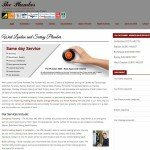 Their technicians are qualified and fully trained. They offer carpet cleaning and hard floor services, specialising in carpet and upholstery cleaning, stone, slate, marble, wood and safety floor cleaning to commercial and domestic sectors. Websites1st deisigned and built the website, SEO, Adwords, email and hosting. 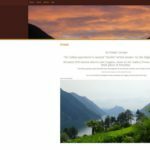 A new https:// secure responsive mobile friendly WordPress website design with SEO package. 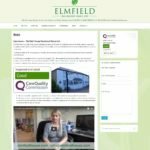 Elmfield House is a small, family owned residential care home near Woking, which caters for the holistic needs of 18 elderly residents whom have residential, mental health or dementia care needs. Websites1st built the entire website, SEO, email and hosting. Photos and videos were taken and incorporated into the website as a photo slider and an embedded video tour of the home. A new, fresh and clean responsive mobile friendly WordPress website design with SEO package. Upgraded to https:// secure website. Going South are a fabulous Musical Comedy Act. The all female trio produce a very special event of musical frivolity and a zany mix of comedy and stunning harmonies. Websites1st built the entire website, SEO, email and hosting. New responsive mobile friendly WordPress website, SEO package and Pay Per Click Adword campaign designed and launched. VIP Chauffeur Cars Based close to London’s Heathrow and Gatwick airports, are pleased to take care of your transport needs, from airport transfers, cruise/docks transfers, weddings, proms, an evening out in London, Special Occasions & Events or any other destination nationwide. Websites1st built the entire website, SEO, PPC Adwords campaign, emails and hosting. New responsive mobile friendly WordPress website with Photo Gallery and embedded YouTube videos. Upgraded to https:// secure website. Ondini is a charming Italian Apartment situated 200 metres above Lake Lugano, close to the Italian/Swiss border. 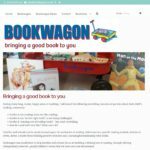 Bookwagon is a new innovative business that researches, recommends and advises on the best quality children’s books in the UK. It also sells the recommended books from its website. Websites1st have supported Bookwagon on their website design process, email and keyword research. Guitar Lessons Camberley provide guitar lessons to people of all skill levels across Surrey, Berkshire and Hampshire. Websites1st are working on the entire online presence – website, email, keyword research, SEO, Google Adwords campaign and social media. The Plumber ABS, with over 25 years of experience serving the Camberley, Surrey area, has a wide knowledge and experience of both modern and old types of plumbing systems and boilers. Websites1st have taken on the website and email hosting and website updating and maintenance. In 2016 a new responsive website was designed along with Adword management and SEO. Upgraded to https:// secure website. Responsive, mobile friendly Website Design – Search Engine Optimisation – Online PPC Marketing Campaign – Social Networking Campaigns – Matching responsive blog. MW Interim Finance provides a professional interim finance director service to a variety of businesses globally. The company now has a very high internet presence to support its off line activities. Websites1st created a new website, implemented a highly targeted SEO campaign and has created a Google AdWords PPC campaign all of which have seen great Google positioning results. 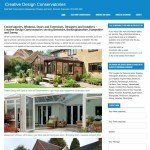 Creative Design Conservatories, based in Wokingham, Berkshire, specialise in providing consevatories, Supalite Solid Roof conservatories, Domestic Extensions, uPVC windows and doors. Websites1st provide website, SEO and Google Adword services. 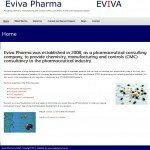 Eviva Pharma was established in 2008, as a pharmaceutical consulting company, to provide chemistry, manufacturing and controls (CMC) consultancy to the pharmaceutical industry, based in Camberley, Surrey. Design of a new responsive website with SEO. This site is easily viewable on tablets, mobile as well as desk top PCs without the need for zooming in on a smaller screen. 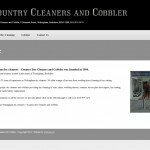 Country Dry Cleaners and Cobbler are a family run business located in the centre of Wokingham with over 20 years of experience. They are high quality dry cleaners and cobblers providing dry cleaning of suits, shirts, wedding dresses, curtains, duvets plus shoe repairs, key cutting, engraving and watch battery replacement. 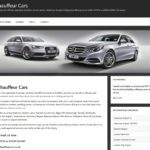 Websites1st built a customised e-commerce shop which incorporates a Sage Pay payments gateway and provided staff with tutorials in order to manage it on an ongoing basis. 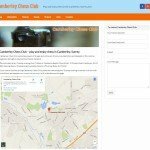 Camberley Chess Club are a leading club in the Surrey, Berkshire and Hampshire areas. They have members of all ages, juniors, senior and from beginners through to International Master standard. Websites1st have enabled the website to show live fixtures, results, team captains etc from the different leagues and divisions that it has teams in. In September 2015 the whole site was upgraded to a responsive, mobile friendly design. 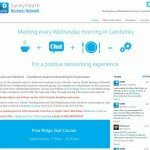 Surrey Heath Business Network (SHBN) is an independent business network group. Its members run businesses in the local Camberley and Surrey Heath area.